The Good Dinosaur is a 2015 American 3D computer-animated drama adventure film produced by Pixar Animation Studios and released by Walt Disney Pictures. Directed by Peter Sohn in his directorial debut and written by Meg LeFauve from an original idea by Bob Peterson, the film is set in an alternate history in which dinosaurs never became extinct. The film follows a young and timid Apatosaurus named Arlo, who meets an unlikely human friend while traveling through a harsh and mysterious landscape. The film features the voices of Raymond Ochoa, Jack Bright, Sam Elliott, Anna Paquin, A.J. Buckley, Steve Zahn, Jeffrey Wright and Frances McDormand. Peterson, who came up with the idea for the story, directed the film until August 2013. In October 2014, Sohn was announced as the new director. The film, alongside Inside Out, marked the first time Pixar released two feature films in the same year. The Good Dinosaur premiered on November 10, 2015 in Paris and was released in the United States on November 25, 2015. The film grossed $332 million worldwide against a $175 million budget. This resulted in a total net loss of $85 million, becoming the first Pixar film to be a box office bomb. In an alternate history, the asteroid that would have caused the extinction of the dinosaurs 65 million years ago passes safely over Earth. Millions of years later, Apatosaurus corn farmers Henry and Ida have children: Libby, Buck, and the runt, Arlo, who has trouble adjusting to farm life. While his successful siblings are allowed to "make their mark" (a mud-print on the family's corn silo), Arlo's timid nature makes tasks difficult for him. Henry attempts to give Arlo a sense of purpose by putting him in charge of guarding their silo, and helps him set a trap. It captures a caveboy, but Arlo doesn't have the heart to kill him, and sets him free. Disappointed, Henry takes Arlo to track the caveboy, leading them into a ravine. Henry saves Arlo from a flash flood before being swept away and killed. The next morning, Arlo wakes to find Spot at his side. They are noticed by a band of pterodactyls, led by Thunderclap, who appear to be conducting a rescue operation but turn out to be savagely carnivorous. When the pterodactyls try to take Spot, Arlo and Spot flee, happening upon a pair of Tyrannosaurus named Nash and Ramsey, who ward off the pterodactyls. Nash, Ramsey, and their father Butch have lost their herd of longhorns, so Arlo offers Spot's help in sniffing them out. They locate the herd, but Butch recognizes the work of cattle rustlers, and uses Arlo as a lure. Arlo and Spot attract the attention of four rustler Velociraptor, allowing Butch and his family to attack. During the fight, Arlo musters his courage and fends off two raptors who have overwhelmed Butch, helping to turn the fight in their favor. Butch kills the two raptors that attacked him while the other two retreat. Having gained their respect, Arlo joins the Tyrannosaurus in driving the cattle south when he sees the familiar mountain peaks of his homeland in the distance, and leaves with Spot to return home. Along the way, they encounter an adult feral caveman in the distance, and though Spot shows interest, Arlo dissuades him and they continue on. As another storm approaches, Thunderclap and the pterodactyls return and attack and carry Spot away. Arlo becomes entangled in vines, where he has a vision of Henry leading him home. Arlo instead resolves to save Spot, making the vision of his father proud before it fades away. Arlo finds and attacks the pterodactyls, who have cornered Spot at the river. Arlo and Spot together plunge Thunderclap and the pterodactyls into the water, where they are swept helplessly downstream. When another flash flood occurs, Arlo leaps into the water to rescue Spot as the two are swept away toward a waterfall. Arlo protects Spot as the two plummet down the fall, and carries him to shore. As they approach Arlo's home, the two again hear the unknown caveman call, and are approached by an entire cave family. With great reluctance, Arlo pushes Spot to join his adoptive family, and the two of them share a tearful goodbye. Arlo finally arrives home to his mother and siblings, and makes his mark on the silo between those of his mother and father. Jack Bright as Spot, a 6-7-year-old human caveboy who befriends Arlo. Sam Elliott as Butch, a Tyrannosaurus who runs a "ranch" filled with prehistoric "longhorns". Jeffrey Wright as Poppa Henry, the father of the Apatosaurus family, until his death. Frances McDormand as Momma Ida, the mother of the Apatosaurus family. Steve Zahn as Thunderclap, the leader of a gang of pterodactyls. Peter Sohn as Forrest Woodbush, a Styracosaurus who has various animals perched on his horns. Carrie Paff as Lurleane, a Velociraptor who is a member of Bubbha's pack. John Ratzenberger as Earl, a Velociraptor who is a member of Bubbha's pack. Calum Mackenzie Grant as Pervis, a Velociraptor who is a member of Bubbha's pack. Bob Peterson and Peter Sohn started working on the film in 2009, when Peterson came up with the idea. The film's first release date of November 27, 2013, was first announced in June 2011. The plot, director and co-director, producer and other small details were announced at the D23 Expo on August 20, 2011. Peterson and John Walker announced the film as The Untitled Pixar Movie About Dinosaurs. On April 24, 2012, Pixar announced that it would be titled The Good Dinosaur. The filmmakers wanted to explore what dinosaurs represent today, and how they are represented in stereotypes. Peterson stated: "It's time to do a movie where you get to know the dinosaur, what it's really like to be a dinosaur and to be with a dinosaur." Peterson said the inspiration for the project came from a childhood visit to the 1964 New York World's Fair where he was impressed by some dinosaur Audio-Animatronics. On the film's title, Sohn stated, "The title is deceptively simple. It has more meaning than it seems." He additionally explained: "Arlo has a lot of issues when he's born. He's fearful and he's weak and he's disconnected from the family because of these issues and he feels like he's not worthy, and so he finds a way to become worthy." In April 2012, Pixar announced that the film's release date had been shifted from November 27, 2013 to May 30, 2014, with Walt Disney Animation Studios' Frozen taking its place. On August 9, 2013, it was announced at the D23 Expo that Lucas Neff, John Lithgow, Frances McDormand, Neil Patrick Harris, Judy Greer, and Bill Hader had joined the cast of the film. By summer 2013, Peterson and Walker had been removed from the film due to story problems. Peterson, who could not crack the film's third act, was absent from the D23 Expo where Sohn and producer Denise Ream presented footage from the film. Pixar's president Ed Catmull explained the departure: "All directors get really deep in their film. Sometimes you just need a different perspective to get the idea out. Sometimes directors… are so deeply embedded in their ideas it actually takes someone else to finish it up." Peterson moved on to another project he is developing at Pixar while Ream replaced Walker, who left to work on Disney's own Tomorrowland. On the subject of changing directors, Ream stated, "Sadly, it happens more often than any of us would like… It's given a lot of thought and care. Bob still works at Pixar [and] he's a beloved member of the studio. He helps out on a lot of the movies. We care about him, but he just needed help getting the movie done." John Lasseter, Lee Unkrich, Mark Andrews, and Sohn stepped in temporarily to work on various sections of the film. In September 2013, The Good Dinosaur was pushed back from May 30, 2014, to November 25, 2015 (the scheduled release date for Pixar's Finding Dory). According to Ream, the primary reason for the rescheduling was "the story was not working, period, full stop, it just was not where it needed to be." In November 2013, due to the delay, Pixar laid off 67 employees of its 1,200-person workforce, following the closure of Pixar Canada a month before, when about 80 employees had been laid off, officially to refocus Pixar's efforts at its main headquarters. In the footage shown at the 2013 D23 Expo, Arlo was a huge dinosaur, Sohn recalled: "In the original version of the film, Spot was so tiny, we really wanted to make him feel like a bug. But people had a tough time connecting that these two had a relationship, because Arlo was so large. It was fun, but at the same time we never believed the growth that they could have together. It was really like, 'I’m best friends with a bee!' Bob Peterson, the original director, his first pitch was just a boy and his dog, and so when I took it I said, 'I want to honor that as much as I can.'" In August 2014, Lithgow revealed in an interview that the film had been dismantled and "completely reimagined" and that he was expected to rerecord his role in the next month, while mentioning that McDormand was still part of the film. In November 2014, it was reported that new elements had been added to the story, such as treating nature as the film's antagonist. Pixar's general manager and president Jim Morris stated, "We all liked the movie from the beginning, but… the story had some kind of fatal flaws in it that none of us really saw. It was kind of a Billy Elliot story. It was a very different kind of movie—there was a whole dinosaur culture and community and so forth. It was one where the Arlo character was kind of repressed by the community. It never quite felt right. It always felt like that we were vilifying this group [of dinosaur characters] that was otherwise a very likeable group. It just didn't feel like it resonated truly." Morris additionally explained: "We give people the chance to work on a story, and we give them our support, but it doesn't always work out… there were story issues that were just not solvable. So we changed the story to make it better, and we're very proud of the film we have now." In October 2014, Sohn was announced as the new director of the film. In June 2015, it was announced that the majority of the cast had been revised. Of the original cast, only McDormand retained her role in the film. It was revealed that Neff had been replaced by Raymond Ochoa, and Lithgow had been replaced by Jeffrey Wright. Arlo's three siblings, to be voiced by Harris, Hader, and Greer had been cut down to a single brother named Buck, voiced by Marcus Scribner, and later, a sister named Libby, voiced by Maleah Padilla. On the cast revisions, Sohn explained: "It was all about finding a younger Arlo, it was really about finding a boy [to play Arlo], so that we could push into that idea of him growing up and becoming a man, so the actor previous—who is a great actor—he was already a man, and so I needed to push that arc and find that compassionate kid, so that was the major kind of change. Then everything else, all the other characters that supported that story came in and out and changed and evolved and through that evolution, some of those performers changed out of it." It was also confirmed that the farmer aspect was still part of the film. The filmmakers wanted nature to be the antagonist for the main character Arlo. Ream noted "Nature can overcome anything, including a massive dinosaur." In order to achieve the needed realism, the film's team traveled to the American Northwest, spending time in Jackson Hole, Wyoming, Juntura, Oregon, and southern Montana. Production designer Harley Jessup stated: "The area has a fantastic variety of landscapes, ranging from the Jackson Valley and the Tetons to the amazing geysers and waterfalls in Yellowstone, we studied the grasslands of Montana and the Red Desert, then incorporated all of it in Arlo’s journey." To use the landscapes that they had experienced, the filmmakers used data from the U.S. Geological Survey, and satellite images from Google Earth. The geographical data provided a foundation that the team then built on. According to supervising technical director Sanjay Bakshi, this gave Sohn "the freedom to shoot in any direction he wanted to make the world feel big and real." In addition, The Good Dinosaur features three-dimensional, volumetric clouds. In previous Pixar films, clouds have been "painted" onto the sets. Light and photography director Sharon Calahan explained: "Storm clouds are almost like a villain in the film. Plus, it’s very labor-intensive to paint clouds, and they’re in almost every scene." Calahan also noted "These particular clouds can be rendered and we can light them, which we’ve never been able to properly do before." According to the filmmakers, the environments and landscapes in the film are not photo-realistic, they are just detailed in a way that advanced technology and style decisions allow. In terms of animating Arlo, animators Rob Thompson and Kevin O’Hara went to a zoo and shot video of elephants in motion. Thompson stated: "One of the most intimidating things to animate is a quadruped, because there’s so much to them and there’s so much to manage. It’s very easy to make it not work if you don’t know what you’re managing. Locomotion is all about efficiency, a lot of times you think, 'We’re animating a big, heavy character. We should slam those feet. That’ll make it feel heavy.' The truth is, that’s not efficient. That wouldn’t be great for the legs." A system where Arlo's head goes up and his chest goes down when his hips goes up, was therefore created. To get an idea of the scale of Arlo, a complete full-size model was built out of card and foam core. In total The Good Dinosaur took up 300TB of server space, ten times as much space as Monsters University (2013). Arlo was designed so that the audience could identify with him and be able to see the "boy" inside the dinosaur. Sohn explained "When Arlo gets lost in the wilderness, you need to worry that he's out of his element and in danger of getting killed, rather than just thinking 'You're an animal. Why don’t you just turn around and eat some leaves?'" He additionally stated "If you put like a realistic dinosaur in the woods, eat some leaves, you’re fine… But we really wanted to play with that twist of this is a boy out there. A dinosaur boy for sure, but trying to infuse those qualities into him… And also keeping him in a world that had an arc to itself. That it would start off being beautiful and then become dangerous. When we had these designs of the trees where they were a little bit more blocky and a little bit more graphic. We put Arlo in front of it, it’s like 'ooh that kind of is cool, but boy, it doesn’t feel like it's that dangerous.' Like when we get a rock stuck on him, it didn’t feel like anything ’cause when we went on our research trips, boy that idea of like you can get, you could die by a small thing like having a rock on your foot. Or you could die by a huge thing like an avalanche, which we tried to kind of explore in the film. So that was one of our main intents." In terms of the film's setting, Sohn stated "Pixar is all about the 'what if' question… 'What if the asteroid missed the earth?' Yeah, we went down the road of: they could be cooking in a dino diner; they could be in space; they could be in anything. But then there was a drawing of a dinosaur farming that kind of sparked people of the idea of 'he’s working hard and this character needs to survive out there.' All of the American dinosaur bones are found in the northwest—from Montana, to Oregon, to Wyoming, and the Dakotas, so the combination of hardworking farm families and the west really brought us into that frontier world immediately… [S]o we started doing research. We started finding all of these people who were surviving out there on the land. They were either cultivating the cattle, or were ranchers in Oregon, or were farmers in the Midwest. It just kept teaching us how much we want to honor this world, and how hard it is to survive out there. It started dictating the world itself." Since The Good Dinosaur is set in a world in which dinosaurs never became extinct, they were instead able to evolve. Herbivores like Arlo and his family become farmers, and carnivores like the T. rex become ranchers. Because they are meant to be reminiscent of cowboys, when the T. rex run, their lower bodies mimic a galloping horse, while their upper bodies have the feel of a riding cowboy. To help inspire Butch's physical look and performance, the filmmakers looked at classic film cowboys such as characters portrayed by Clint Eastwood and Jack Palance. The film's score was composed by Mychael Danna and his brother, Jeff, replacing Thomas Newman, who was originally attached to score the film when it was set to be directed by Bob Peterson. It marks the first Pixar film to be scored by two composers. Danna was approached by Sohn and Ream due to his score for Life of Pi, which won an Academy Award. Having a lot of work, he invited his brother as a co-writer. Walt Disney Records released the soundtrack on November 20, 2015. All music composed by Mychael and Jeff Danna. The Good Dinosaur: Dino Crossing is a game based on the Pixar film The Good Dinosaur. It was released on the App Store, Google Play, and Amazon App Store on November 19, 2015. A figure of Spot and Power Discs of Arlo, Ramsey, Nash, and Butch have been released for Disney Infinity 3.0. The Good Dinosaur was theatrically released on November 25, 2015. Before the rescheduling from 2014 to 2015, a Monsters University short film titled Party Central was set to accompany the film, but was instead shown with the theatrical release of Disney's Muppets Most Wanted. In April 2015, it was announced that a new Pixar short, Sanjay's Super Team, directed by Sanjay Patel, would be shown in front of The Good Dinosaur instead. The film's teaser trailer was released on June 2, 2015, and the first official trailer was released on July 21, 2015. The film received an exclusive run at The Grand Rex in Paris a week before its U.S. and European premiere. The Good Dinosaur was released by Walt Disney Studios Home Entertainment on Blu-ray (2D and 3D), DVD, and digital download in the United States on February 23, 2016. Blu-ray bonus features include Sanjay's Super Team, audio commentary, behind-the-scenes featurettes, deleted scenes, and the "Hide and Seek" short promotional clip. The Good Dinosaur grossed $123.1 million in the United States and Canada and $209.1 million in other countries, for a worldwide total of $332.2 million against a production budget of $175–200 million, Adding in the marketing budget, the film had a cost of $350 million, which it was unable to recoup - causing Walt Disney Studios to lose $85 million unadjusted for inflation. However, the film proved to be much more financially successful in home video sales. 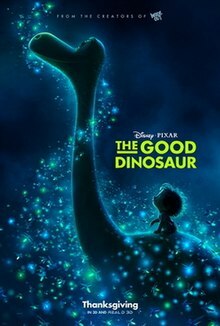 In North America, The Good Dinosaur opened on Wednesday, November 25, 2015 alongside Creed and Victor Frankenstein, as well as the wide releases of Brooklyn, Spotlight, and Trumbo. The film was projected to gross $60–65 million from 3,749 theaters in its first five days, including $45 million in its opening weekend. It made $1.3 million from its Tuesday night previews and $9.8 million on its first day. The film ended up grossing $55.6 million in its first five days, including $39.2 million in its opening weekend, finishing second at the box office behind the second weekend of The Hunger Games: Mockingjay – Part 2. Outside North America, it earned $28.7 million from 39 markets, including 8 significant markets. Unlike the US, where it had the benefit of the Thanksgiving weekend, it did not have the same benefit internationally. Rather, its release date was designed to set it up to run through the December holiday. The top openings were in the United Kingdom ($4.3 million), Mexico ($3.6 million), France ($3.2 million), Argentina ($2.2 million), and Russia ($2.1 million). Of those, it opened at No. 1 in Mexico, Argentina and Russia. In terms of total earnings, its leading markets are the United Kingdom ($10.1 million), Mexico ($8.7 million), and France ($8.1 million). The review aggregation website Rotten Tomatoes gives the film a rating of 76%, based on 202 reviews, with a rating average of 6.6/10. The site's critical consensus reads, "The Good Dinosaur delivers thrillingly beautiful animation in service of a worthy story that, even if it doesn't quite live up to the lofty standards set by Pixar, still adds up to charming, family-friendly entertainment." On Metacritic, the film has a weighted average score of 66 out of 100, based on reviews from 37 critics, indicating "generally favorable reviews." Audiences polled by CinemaScore gave the film an average grade of "A" on an A+ to F scale. Kenneth Turan of the Los Angeles Times described it as "antic and unexpected as well as homiletic, rife with subversive elements, wacky critters and some of the most beautiful landscapes ever seen in a computer animated film." Manohla Dargis of The New York Times felt the film "has a few things on its mind, but its tone is overwhelmingly playful, not hectoring." Joe Morgenstern of The Wall Street Journal opined that "As Pixar productions go, this one isn't a groundbreaker, but it's heartfelt and endearing, as well as visually splendiferous, and kids will love it for sure." "Clever and cloying by turns, it's a movie that always seems to be trying to evolve beyond its conventional trappings, and not succeeding as often as Pixar devotees have come to expect," wrote Justin Chang of Variety. Many of the reviewers praised the sophistication of its nearly photorealistic backgrounds. Christopher Orr of The Atlantic felt it to be the studio's first film explicitly targeted towards children, though it is "by no means a bad movie […] It's a simple story, well-told." Mark Feeney, writing for The Boston Globe, felt similarly, deeming it a "very middling movie […] The Good Dinosaur generally features a sort of sentimentality and emotional reductiveness that make it seem meant for small children as no previous Pixar movie has." The Washington Post's Stephanie Merry dubbed it "a nice, conventional story, but it’s not Pixar-level imaginative." Richard Roeper, for the Chicago Sun-Times, felt it "one strange, aggressively gross and dark adventure […] Inconsistent and weird, The Good Dinosaur is second-level Pixar all the way." Michael Rechtshaffen of The Hollywood Reporter panned its "disappointingly derivative" screenplay. ^ a b c d Keegan, Rebecca (August 30, 2013). "Pixar Animation yanks director Bob Peterson off 'The Good Dinosaur'". Los Angeles Times. Retrieved August 30, 2013. ^ Chang, Justin (November 13, 2015). "Film Review: 'The Good Dinosaur'". Variety. Retrieved November 13, 2015. ^ a b c d e Burlingame, Jon (November 3, 2015). "'Good Dinosaur' Score Breaks Pixar Mold". Variety. Retrieved November 12, 2015. ^ FilmL.A. (June 15, 2016). "2015 Feature Film Study" (PDF). p. 25. Retrieved June 17, 2018. ^ a b "The Good Dinosaur (2015)". Box Office Mojo. Retrieved August 20, 2016. ^ "Pixar Releases Trailer for 'The Good Dinosaur' (VIDEO)". Christian Post. Retrieved August 2, 2015. ^ McClintock, Pamela (January 22, 2016). "'Good Dinosaur': Analyzing Pixar's First Box-Office Disaster". Billboard-Hollywood Reporter Media Group. The Hollywood Reporter. Retrieved March 21, 2019. ^ a b c d e f g h i j k l "Meet the New Cast of Disney•Pixar's The Good Dinosaur". The Walt Disney Company. June 12, 2015. Retrieved June 12, 2015. ^ a b c d e f Han, Angie (June 17, 2015). "'The Good Dinosaur' Preview: How John Ford and Hayao Miyazaki Helped Inspire Pixar". /Film. Retrieved June 18, 2015. ^ a b c d e f g h i "'The Good Dinosaur' Official Character Descriptions". stitchkingdom.com. November 10, 2015. Archived from the original on November 12, 2015. Retrieved November 10, 2015. ^ Dougherty, Robert (October 12, 2015). "'The Good Dinosaur' Characters Receive Profiles". themovienetwork.com. Retrieved October 12, 2015. ^ Desta, Yohana (September 17, 2015). "How Pixar created the beautiful, dangerous world of 'The Good Dinosaur'". Mashable. Retrieved September 18, 2015. ^ Bastoli, Mike (June 20, 2011). "Untitled Pixar feature coming Nov. 27, 2013". Big Screen Animation. Archived from the original on March 17, 2013. Retrieved March 1, 2013. ^ a b Rizvi, Samad (August 21, 2011). "D23 2011: A Few More Details On Pixar's Dinosaur Movie". Pixar Times. Retrieved March 1, 2013. ^ a b Rizvi, Samad (April 24, 2012). "CinemaCon 2012: Pixar's Dinosaur Film Gets A Title, New Lee Unkrich Project Announced". Pixar Times. Retrieved March 1, 2013. ^ a b c Keegan, Rebecca (May 31, 2012). "Pixar's 'The Good Dinosaur' will warm up a prehistoric reputation". Los Angeles Times. Retrieved March 1, 2013. ^ a b Butler, Tom (June 16, 2015). "Why Pixar's The Good Dinosaur Had To Overhaul Its Voice Cast (Exclusive)". Yahoo Movies UK. Retrieved June 17, 2015. ^ Rizvi, Samad (December 23, 2011). "Pixar Dinosaur Film Bumped Off Nov 2013 Release Date". Pixar Times. Retrieved March 1, 2013. ^ Beard, Lanford. "Pixar preview: Casts announced for 'The Good Dinosaur,' 'Inside Out'". Entertainment Weekly. Retrieved August 9, 2013. ^ a b Kilday, Gregg (December 4, 2013). "Pixar vs. Disney Animation: John Lasseter's Tricky Tug-of-War". The Hollywood Reporter. Retrieved December 4, 2013. ^ Fischer, Russ (August 26, 2013). "Rumor: 'The Good Dinosaur' Director Bob Peterson Is Off the Film". SlashFilm. Retrieved August 30, 2013. ^ Taylor, Drew (August 26, 2013). "Pixar Filmmaker Bob Peterson Reportedly Off 'The Good Dinosaur,' Studio Seeking Replacement". The Playlist. Retrieved August 26, 2013. ^ a b Anders, Charlie Jane (November 2, 2015). "How Pixar Rescued The Good Dinosaur From Creative Extinction". io9. Retrieved November 2, 2015. ^ Goldberg, Matt (November 5, 2015). "'The Good Dinosaur' Producer Denise Ream on Re-Casting the Voices and More". Collider. Retrieved November 7, 2015. ^ Miller, Daniel (November 22, 2013). "Pixar undergoes layoffs due to 'The Good Dinosaur' delay". Los Angeles Times. Retrieved November 23, 2013. ^ a b "Director Peter Sohn on the Evolution of The Good Dinosaur". Disney Insider. February 24, 2016. Retrieved February 26, 2014. ^ "John Lithgow Says The Good Dinosaur Was Dismantled and Reimagined". Collider.com. May 30, 2014. Retrieved August 19, 2014. ^ Keegan, Rebecca (November 18, 2014). "Pixar redraws the lines for 'Good Dinosaur'". Los Angeles Times. Retrieved November 18, 2014. ^ Lee, Edmund (September 28, 2015). "Chinese film-goers may see Pixar's Good Dinosaur before US". South China Morning Post. Retrieved September 28, 2015. ^ Wai Yee, Yip (October 1, 2015). "Pixar's first Asian-themed film to debut next month, along with The Good Dinosaur". The Straits Times. Retrieved October 2, 2015. ^ Amidi, Amid (October 22, 2014). "Peter Sohn Named New Director of Pixar's 'The Good Dinosaur'". Cartoon Brew. Retrieved October 22, 2014. ^ Douglas, Edward (June 17, 2015). "A Special Sneak Preview of Disney•Pixar's The Good Dinosaur". Comingsoon.com. Retrieved June 17, 2015. ^ a b Zakrzewski, Cat (October 9, 2015). "Pixar Studios Doubles Effects In Upcoming Film 'The Good Dinosaur'". TechCrunch. Retrieved October 9, 2015. ^ a b Lesnick, Silas (October 8, 2015). "The Good Dinosaur Story: Behind the Scenes at Pixar". Comingsoon.net. Retrieved October 9, 2015. ^ a b Zacuto, Ben (November 16, 2015). "EXCLUSIVE: GOOD DINO HD Stills and Fun Facts". EverythingPixar.com. Retrieved November 18, 2015. ^ Sciretta, Peter (November 2, 2015). "Interview: Director Peter Sohn Talks 'The Good Dinosaur'". /Film. Retrieved November 2, 2015. ^ "Walt Disney Records Releases "The Good Dinosaur" Original Motion Picture Soundtrack Score Composed By Mychael And Jeff Danna" (Press release). PR Newsire. Burbank, California. November 20, 2015. Retrieved December 7, 2015. ^ Bradley, Dan (November 3, 2015). "Disney Infinity 3.0 November Figures and The Good Dinosaur Power Discs Out Now". theHDRroom.com. Retrieved November 8, 2015. ^ Fischer, Russ (August 9, 2013). "'Monsters University' Short Film 'Party Central' Revealed". /Film. Retrieved August 9, 2013. ^ Keegan, Rebecca (April 28, 2015). "Pixar artist Sanjay Patel gets personal with 'Sanjay's Super Team'". Los Angeles Times. Retrieved April 28, 2015. ^ "The Teaser Trailer and Poster for Pixar's The Good Dinosaur," ComingSoon.net, June 2, 2015. ^ The Good Dinosaur - Official US Trailer. YouTube. July 21, 2015. Retrieved July 25, 2015. ^ McClintock, Pamela (November 15, 2015). "Paris Attacks: 'Spectre' Prevails in France Despite Cinema Closures". The Hollywood Reporter. Retrieved November 16, 2015. ^ Szadkowski, Joseph (February 25, 2016). "Blu-ray review: The Good Dinosaur, Pixar's prehistoric travelogue". The Washington Times. Retrieved February 26, 2016. ^ "'The Good Dinosaur' on 3D Blu-ray on February with Deleted Scenes, Original Short (Sneak Peek)". Stitch Kingdom. January 22, 2016. Archived from the original on January 25, 2016. Retrieved March 10, 2016. ^ McClintock, Pamela (November 23, 2015). "Box-Office Thanksgiving Preview: 'Good Dinosaur' Takes On 'Hunger Games: Mockingjay'". The Hollywood Reporter. Retrieved December 10, 2015. ^ Faughnder, Ryan (November 24, 2015). "'Good Dinosaur' and 'Creed' to battle 'Hunger Games' at holiday box office". Los Angeles Times. Retrieved December 10, 2015. ^ McClintock, Pamela. "'Good Dinosaur': Analyzing Pixar's First Box-Office Disaster". The Hollywood Reporter. Retrieved November 13, 2016. ^ Guerrasio, Jason. "'Pixar finally has its first box-office bomb". Business Insider. Retrieved November 13, 2016. ^ Brew, Simon, "The Good Dinosaur is Pixar's Lowest Grossing Movie", Den of Geek!, January 7, 2016, Retrieved April 7, 2016. ^ "Pixar Total Grosses", Box Office Mojo, Retrieved April 7, 2016. ^ Kenny, Charles. "'Pixar's First Flop is Being Quietly Swept Under the Rug". IndieWire. Retrieved November 13, 2016. ^ McKnight, Brent. "The Good Dinosaur Somehow Managed To Find Its Audience On Home Video". Cinema Blend. Retrieved July 9, 2016. ^ Arnold, Thomas K. "Pixar's 'Good Dinosaur' Tops Home Video Sales Charts". Variety.com. Retrieved July 9, 2016. ^ Tartaglione, Nancy (December 6, 2015). "'In The Heart Of The Sea', 'Point Break' Surf Into Top 5 With Offshore Debuts – International Box Office Update". Deadline Hollywood. Retrieved December 7, 2015. ^ Tartaglione, Nancy (December 13, 2015). "China Makes 'Surprise' Entrance At No. 1; Katniss, Arlo & 007 Top Calm Studio Frame – Intl Box Office Update". Deadline Hollywood. Retrieved December 14, 2015. ^ "The Good Dinosaur (2015)". Rotten Tomatoes. Fandango Media. Retrieved November 12, 2018. ^ "The Good Dinosaur Reviews". Metacritic. CBS Interactive. Retrieved November 28, 2015. ^ Turan, Kenneth (November 25, 2015). "Review: 'The Good Dinosaur' is a wondrous, wacky Jurassic world for tykes". Los Angeles Times. Retrieved December 28, 2015. ^ a b Dargis, Manohla (November 24, 2015). "Review: In 'The Good Dinosaur,' a Reptile Tends to His Human Pet". The New York Times. Retrieved December 28, 2015. ^ Morgenstern, Joe (November 25, 2015). "'The Good Dinosaur' Review: A Warm-Blooded Jurassic Lark". The Wall Street Journal. Retrieved December 28, 2015. ^ Chang, Justin (November 13, 2015). "Film Review: 'The Good Dinosaur'". Variety. Retrieved December 28, 2015. ^ a b Orr, Christopher (November 25, 2015). "The Good Dinosaur: Pixar's First Movie Just for Kids". The Atlantic. Retrieved December 28, 2015. ^ a b Feeney, Mark (November 24, 2015). "Pixar's 'The Good Dinosaur' lives in a Disney world". The Boston Globe. Retrieved December 28, 2015. ^ a b Merry, Stephanie (November 24, 2015). "'The Good Dinosaur' fails to live up to the Pixar promise". The Washington Post. Retrieved December 28, 2015. ^ Richard Roeper (November 24, 2015). "'The Good Dinosaur': Not As Evolved As Most Pixar". Chicago Sun-Times. Archived from the original on December 26, 2015. Retrieved December 28, 2015. ^ Rechtshaffen, Michael (November 13, 2015). "'The Good Dinosaur': Film Review". The Hollywood Reporter. Retrieved December 28, 2015. Wikimedia Commons has media related to The Good Dinosaur.